Marilyn Chavannes hadn’t always wanted to be a family doctor, especially with most of her classmates in the School of Medicine and Health Sciences eyeing specialty fields like internal medicine and pediatrics. But after the fourth-year graduate student took a medical mission trip to her native Haiti during her first year at the medical school, she was hooked into the generalized field of family medicine. Last Friday’s residency Match Day for fourth-year medical students revealed which fields future doctors are choosing, and Chavannes is part of a small but growing contingent of medical students at GW and nationwide who are opting to do their three-year residency in family medicine – a placement that often means lower pay and less prestige. 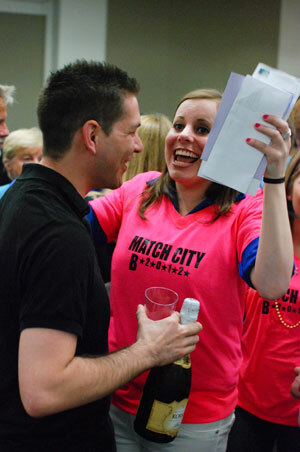 Fourth year medical student Ivy Haskins celebrates the news of her residency placement in general surgery. During the event, held on March 16th at Ross Hall, Fourth year GW medical students received letters revealing their respective residency placements. Now with 12 students matching into family medicine residencies at GW, double the total from last year, more students are trying to shed the stereotypes of family physicians as the “jack of all trades, master of none,” fourth-year medical student David Goodman said. On Match Day, an annual cathartic event for medical students across the nation, 172 medical students crammed into Ross Hall to tear open envelopes revealing where they were accepted to do their residencies. This past academic year, students have traveled the country, interviewing with potential hospitals and medical centers that they hoped would be their homes for the next three to seven years. Students and directors at American teaching hospitals each list their preferences for residency matches, which are filtered through a computer algorithm run by the National Resident Matching Program. In residency assignments spanning from Seattle to Albany, Ga., budding family physicians will be trained to handle a wide range of cases and treat both adults and children instead of specializing in one area or age group. Family doctors serve more rural and poor communities than any other medical specialty, according to the American Academy of Family Physicians. Although the 12 GW students who matched into family medicine represent only 7 percent of the class, the growth is surprising in a medical school without a department of family medicine, the medical schools’ senior associate dean for academic affairs Scott Schroth said. “In D.C., where there’s a [specialty] physician on any street corner, family physicians haven’t historically had a big presence,” Schroth said. After a decades-long slide nationally in the number of family doctors, the rise in students taking up family medicine residencies at GW mirrors a three-year upward trend across the country, said Wendy Biggs, the assistant director of the American Academy of Family Physicians. According to the National Resident Matching Program, about 48 percent of the vacancies in family residency programs in the U.S. were filled this year, the highest rate in the last five years. “It is becoming more widely recognized that family medicine is the foundation of a strong healthcare system,” Biggs said, citing studies that show communities with strong family doctors save costs by avoiding emergency room visits. The lower earning potential of family doctors can turn off medical students, many of whom face student loan debt after graduation. According to an annual survey of physicians’ salaries, family doctors earned an average base salary of $189,000 in 2010, dwarfed by specialists like anesthesiologists who earned $344,000 on average. Goodman said he gravitated toward family medicine after interning with family physicians and enjoying the smaller program sizes. “I took a month or two months to do a rotation with family medicine, and they knew what they were doing and when to ask for help,” Goodman said.